← 1st it’s global warming, then ebola …. George Sheehan once said that “…..running is the purist form of play”. No argument here..
Last Saturday my running club (SJAC) held their annual 5k Great Grace Race and Pancake breakfast. It’s a very casual/family oriented race that’s purpose is to “give back” to Grace Church here in town. The proceeds of the race go primarily to support the church’s out reach ministries and also it’s a way of saying thank you to the church community for allowing SJAC to use their facilities for their monthly meetings. It’s warming to think about what and who their out reach ministries touch. 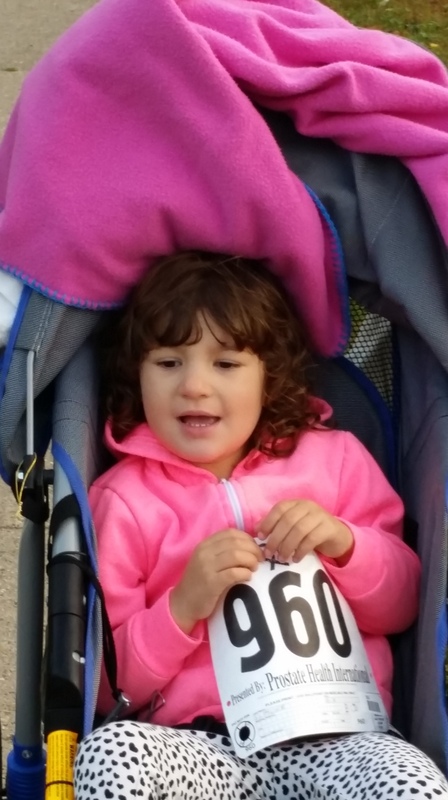 We purchase a BIB, posed for a couple of photos and then the horn sounded and we were off… Pushing a stroller while running/jogging is not as easy as it may seem. Complicating our efforts were Mia’s long legs that she insisted on resting on the front wheel acting as a drag or brake making it harder to push. It was soon evident to us as well, that the stroller had a strong pull to the left – with the course predominantly a clockwise route around the creeks, the “left-pulling Jogger” made for an interesting adjustment filled run. “LOOK OUT!! 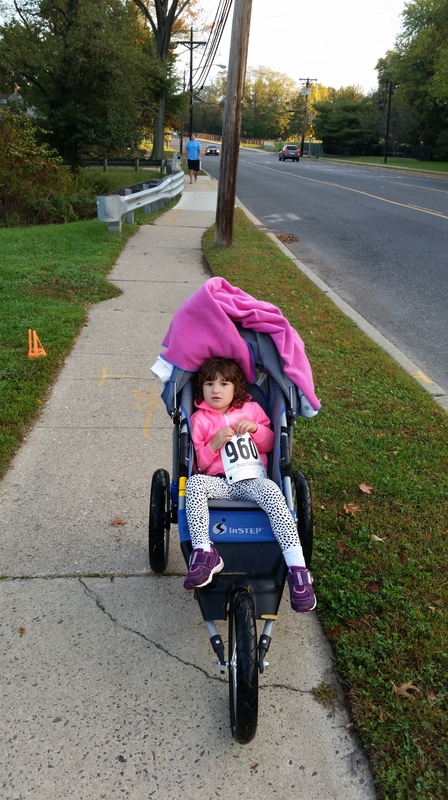 Crazy senior citizen wrestling with a jogging stroller for 3.1 miles!” But we made it with Mia enjoying the journey and gran somewhat relieved the finish-line was in site. I asked Mia if she wanted to climb out of the jogger and run thru the finish gate but she said ” Nay Gran, just keep pushing..” I did. Before the race started I took this short video of Mia warming up. 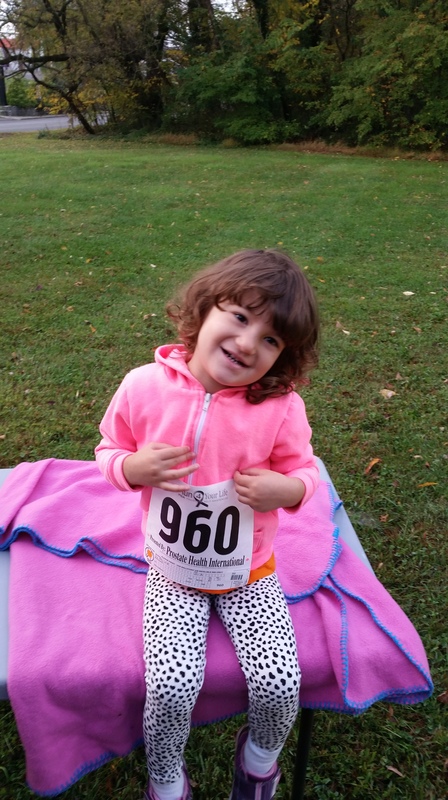 When she turns around to come back I realized I captured a Glympse of the inner child all runners must have in them. Definitely towards the end of her return you can see her lost in her own little world of self awareness. She seems to be so natural – no perfect running form needed, but so very natural and perfect for her. Children run as they think, from one thought to the next, from one moment to the next constantly at play. The next morning, fighting the tail end of a cold, I skipped the Sunday morning group run but went out later for 10 wonderful miles of play…. 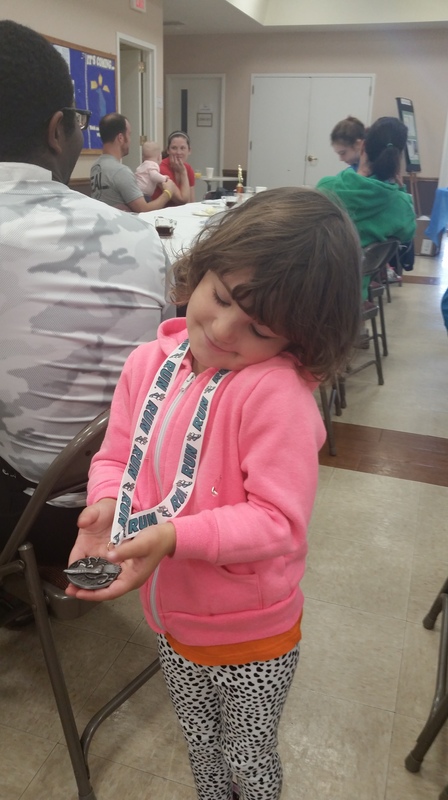 BTW, Mia got a medal!!!! I think her expression is wonderful and typical of most runners ! !